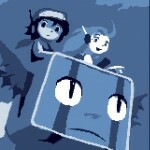 I assume that most people are in-the-know about such things, but in case anyone missed it, today is the day on which the WiiWare version of Cave Story has finally been released. It is looking mighty fine. Mighty fine indeed. Sadly, for various (amicable) reasons, they weren’t able to keep Shih-Tzu’s excellent translation, but from everything I’ve seen and heard, the replacement is still quite good. And if you’re reading this and you still don’t know what Cave Story is, then it is possible you have wasted your life, and there is nothing that I can say that will make things better. This entry was posted in Cool People, Other Peoples' Games. Bookmark the permalink. Follow any comments here with the RSS feed for this post. Post a comment or leave a trackback: Trackback URL.